I had a great weekend. Pretty much did what I wanted to do, oh yes, I still managed to get the important stuff (laundry for one) done, but it was a quiet weekend without any other commitments or plans. So, I started off on Friday with my Ombre Zipper Pouch from Sewlux Fabric’s monthly pouch club. Loved it! Then decided I needed to clean out my sewing room. I’m about to start a busy garment sewing time and I needed to get stuff cleaned and organized. While I was sorting and purging I found my January monthly pouch, so decided rather then just put it away and forget about it, I might as well just get it done. So, I did. While I like it, I struggled with making it. I have never done the whole braid thing that the body of the pouch is made of. Once you sew the braids together then you are supposed to cut it down in size. But, mine wasn’t even close to being able to cut it the size of the pattern so I just made it smaller. Here’s a comparison of the two pouches. And, this was the first time I’ve used Annie Soft and Stable, really liked that it gives the pouch some stability and firmness. I will be using more of that in other pouches. I kept cleaning and sorting, throwing away some scraps that I realistically will never use. 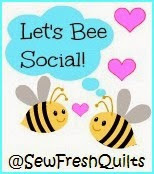 I receive a couple monthly subscription boxes, one of them is the Fat Quarter Shop Sew Sampler box. Those blue boxes are the best monthly gift ever! I had been keeping some of the empty boxes for some reason, but nope, since I’m cleaning and purging, they got broken down and out in the recycling. BUT…. September’s box was still filled. I pulled out the Farmer’s Market material and decided to make the table runner that was the pattern for the month. I’ve never made a runner, always think they are super cute, but I don’t have a coffee table and didn’t see any reason to make one. But I liked the looks of the pattern and the material is darling, so next thing I knew, this was done! Still need to figure out what to use for tthe backing, but I think this will fit on my dining room table just fine! I kept cleaning and sorting, this kind of “work” is fun! 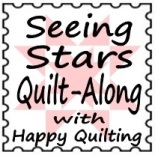 Next thing I found was another monthly box, this one February’s Quilty Box . This one was curated by Julie Herman, also known as Jaybird Quilts. Julie does AMAZING quilts and pattern and while I’ve drooled over them for a while I haven’t been brave enough to try one yet. The box had the material and pattern for her Nova Table Topper and I figured I would give it a try. It included her Sidekick ruler which makes cutting triangles easy. So, I started cutting and sewing and in about an hour I had the top done! WOW! I had so much fun making it. The colors were a bit out of my comfort zone, but I love the blues and greens. But, how am I ever going to finish it? She has amazing quilting on hers, there’s no way I could do something that great. And, what am I going to put on the back. Hmmm, what if I made it reversible so I could use it during more of they year? Wouldn’t a Spring colored one be darling? Or how about a red, white and blue one? Or Christmas….. See where I’m going? So, I whipped out ANOTHER one that I’m going to use for the backing. I really have no idea how I’m going to quilt them, or even sew them together. Do I sew them right sides together and turn it? Or stick them wrong sides together and try to bind the edges? I don’t know for now, but I am loving the tops and am already thinking of other color combinations I can make. I’m thinking I know what my kids are going to get for Christmas. All in all, it was a great weekend/Staycation. I need to put some of these on my calendar more often. And, yes, my sewing room is ready for the upcoming garment sewing. And my design wall is filled up again. I haven’t even mentioned the quilt on the right. That one is going on 6 years in the making but since it’s on the wall, progress is being made. I’m feeling pretty good about my weekend.